Fox Dealer has been growing at a supersonic pace! Making the 2018 Inc. 500 list validates the relentless hustle we put in every day. I couldn’t be prouder of my team. They put their heart into their work, and being among the top 50 companies shows we’re heading in the right direction. Gian Carlo Asong, CEO of Fox Dealer, commented, "Fox Dealer has been growing at a supersonic pace! Making the 2018 Inc. 500 list validates the relentless hustle we put in every day. I couldn’t be prouder of my team. They put their heart into their work, and being among the top 50 companies shows we’re heading in the right direction." 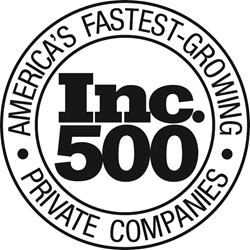 Not only have the companies on the 2018 Inc. 5000 (which are listed online at Inc.com, with the top 500 companies featured in the September issue of Inc., available on newsstands August 15) been very competitive within their markets, but the list as a whole show staggering growth compared with prior lists. The 2018 Inc. 5000 achieved an astounding three-year average growth of 538.2 percent, and a median rate of 171.8 percent. The Inc. 5000’s aggregate revenue was $206.1 billion in 2017, accounting for 664,095 jobs over the past three years. Fox Dealer is a personalized automotive agency where powerful digital technology meets white glove customer service. Fox specializes in custom responsive websites, stunning creative design, and cutting-edge digital marketing. As a Google Premier Partner and the go-to provider for many high-performance dealerships, the Fox name is quickly becoming synonymous with excellence. Combining impressive results with 24/7 personal customer support, Fox is there when you need us. More information on Fox Dealer visit at https://foxdealer.com. The 2018 Inc. 5000 is ranked according to percentage revenue growth when comparing 2014 and 2018. To qualify, companies must have been founded and be generating revenue by March 31, 2014. They had to be U.S.-based, privately held, for profit, and independent—not subsidiaries or divisions of other companies—as of December 31, 2017. (Since then, a number of companies on the list have gone public or been acquired.) The minimum revenue required for 2014 is $100,000; the minimum for 2017 is $2 million. As always, Inc. reserves the right to decline applicants for subjective reasons. Companies on the Inc. 500 are featured in Inc.’s September issue. They represent the top tier of the Inc. 5000, which can be found at http://www.inc.com/inc5000.